Nick Fisherman: Microstory 370: Utility? I’ve almost always dreaded getting to this entry. Not since the very beginning, mind you, because when I first laid this series out, I had an idea of what this meant. You know that thing where you write a note on a fast food restaurant napkin, then you go back to it, and you’ve lost context? If you’re a digital native, then no, I guess you don’t. Well, it’s annoying. Utility is about being useful, so I understand that part. What I don’t get is why I thought it was sufficiently different than, say economic participation or capacity to provide or positive contribution. Did I tell you how my process started? I first took Maslow’s hierarchy of needs, and teased out 33 “needs” people have, some of which are more like wants. Then I broke them all into thirds so that I could make a whole set. I think I stemmed this one from preexisting topics without quite being able to admit to myself that it wasn’t different enough. I’m just useless. Haha, get it? I just went to my website and found out that I’ve already told you this. But I think it’s okay because what are the chances you read that other one, and then read this one? What are the chances you’ve read any of them, including this one? This story has two...uh. No, two hundred twenty, wait now I’m off. Two-hundred and thirty-nine words. Crap. As of the end of this sentence, I’ve done 252 words so far. There—noo! Have I told you about special characters? Ellipses and em dashes throw off the word count. Some counters count the string of text on either side of them as separate words, and some don’t. So if you’ve ever plugged one of these into an online word counter, and thought I was off, that’s just your perspective. Whoa, #throwbackThursday to my Perspectives series, which I personally consider to be my greatest microfiction achievement. We’ll have to wait and see with my faux headlines from the 500s, my dreams in the 800s, and my 99 900s problems. Oh yeah, I have this planned out through 2018 and beyond. 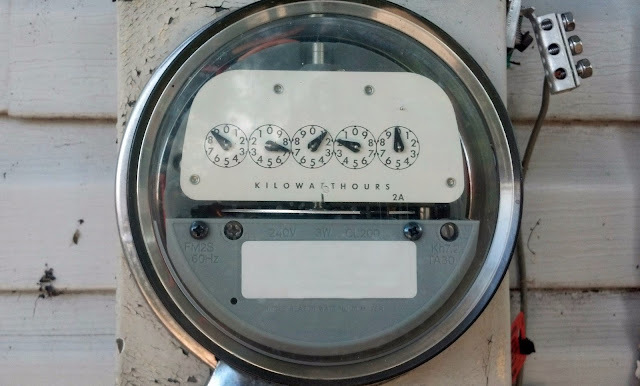 Here’s a picture of a distorted utility meter as a pun. I know what all of this means, I swear.